Mike Carnegie is the assistant captain of the Calgary Roughnecks of the National Lacrosse League (NLL), but if you met him, you would never know. He rarely, if ever, speaks of his accomplishments — of which he has many, including a World Indoor Lacrosse Championship for Team Canada in 2010 — and is more likely to show you a picture of his wife Hailey or his 1-year old son Charlie than his 2009 NLL Championship medal. If you even refer to Mike as a professional athlete he will quickly point out that he is actually not a full-time professional athlete because most of his time is devoted to and most of his paycheck comes from his 9-5 job as a survey analyst with Stantec Geomatics in Calgary. The need to have a job outside of lacrosse is, of course, a blessing and a burden for most NLL players. It gives the players financial stability, but a burden because it means that weeknights and weekends are spent practicing and traveling for lacrosse. However, the burden that NLL players carry to do something they love is nothing compared the burden that many kids around the world carry everyday in order to live. This is why Mike has chosen to donate half of his NLL salary to a charity called Partners that does relief and development work in the country of Burma. Burma, a country of civil unrest since the 1940’s and military oppression since the 1960’s, has been accused of countless human rights violations. Burma currently has more child soldiers than any other country in the world, with some estimates having 70,000 children 12 and under solicited as child soldiers, and it is believed that as many as 200,000 men, women and children remain internally displaced due to ongoing conflicts. Over the past three seasons, Mike will have donated $30,000 of his professional lacrosse salary to Partners. Mike’s contribution has helped with refugee work, the building of schools and medical clinics, and the establishment of sustainable farming and land use for the community. But again, even though Mike has been called “one of the best people in the NLL,” don’t expect him to parade his work around the locker room or with fans. Mike works hard to bring awareness to the situation in Burma through his Facebook page and the Mike Carnegie Burma Campaign launched each of the past three years, but his humble hope is that he can use the gifts that God has given him to help those in need. Mike’s humility and generosity can be traced in two directions. The first direction is his humble beginnings. 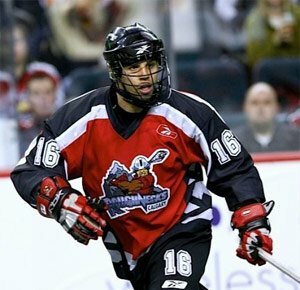 Mike entered the NLL as an undrafted free agent as a member of the Buffalo Bandit practice squad in 2007 before he signed and made the active roster of the Calgary Roughnecks in 2008. In spite of the challenges, Mike remains, in Rodd’s words, “one of the great lights in pro-sports.” Mike’s humble and hard-working demeanor coupled with his humanitarian efforts has made him a great model of what the life of a professional athlete, a husband, a father, and a follower of Christ can look like. Just don’t expect to hear that from him.